In 1982, Linda Kitson captured the danger and destruction of the Falklands conflict as Britain’s first Official War Artist. Some 35 years later she has begun documenting the construction and development of London – on an iPad. How times change. London has been drawn, painted and photographed from every nook and cranny. 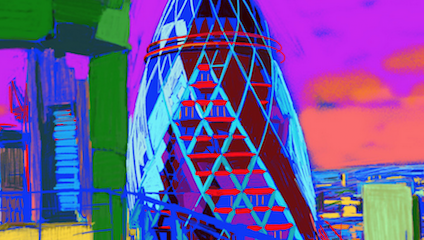 However, in her latest exhibition, ‘iPad Pictures of the Scalpel & The City’ celebrated British artist Linda Kitson presents a bold and unique perspective of the city. All produced using an iPad - a therapeutic tool which turned into another art-form - Kitson’s brightly coloured pictures stand in stark contrast to her previous monochrome line drawings. We speak with the artist about the freeing power of the iPad, her love of colour, and why she’s Instagram’s no.1 fan. London Calling: Hi Linda, thank you for speaking with London Calling today. This exhibition is such an interesting, and noteworthy, shift from your work with the more traditional pencils, pastels and paints. How did you come to use the iPad as an artistic tool? Linda Kitson: Well, it started with an illness – I got incapacitated by depression and that was about 10-12 years of not drawing. My psychiatrist said you have to keep your mind going, so I started playing games on my iPhone – snakes and ladders and such– just to keep lively. From that I graduated to funny drawings on the iPhone, but you can’t do much with your finger. And then came the iPad, which got me along the Embankment drawing the wonderful buildings with the stylus. LC: As an artist what are the benefits, and what are the difficulties, of using an iPad? LK: When I came out of my stupor I lost confidence and the continuity [of drawing]. But the iPad became something I was uninhibited about - it has taken me out of myself and worrying about whether it is any good anymore or whether I can do it. With an iPad you get a second chance - it’s like painting – you get to work over and over it. It’s just a more forgiving and yielding way of working, whereas with the line - the way I did it was instantaneous and that had to be it, if not I did another one and another one. Also, there just isn’t any room to draw in London. There is a lot of detail and it’s all going up in front of you, so the iPad is really the most ideal tool as you can take it anywhere. And, for an artist, you don’t have to have a big studio and all the paraphernalia. I loved the contact [of drawing] - almost inventing the paper, lounging with it – but to do that on a glass screen is just so different. LC: In terms of your process with the iPad, do you immediately begin to draw, or do you take a photo to then work off? LK: What I’m doing at the moment is that in very complicated situations I take photos which gives me the composition. I never did that before because with direct drawing you just go straight into it. And as I wasn’t able to get whole panoramas, I honed in on something particular. But with the iPad you can get the composition pinned with a photograph, so you can then move pictures around, put two or three together, and get a whole picture. I had a lot to learn because it’s very complicated - much like London life! LC: You have exclusive access to a number of the sites depicted in your work, which offers a new perspective of many of the city’s most iconic buildings and landmarks. What role does perspective play in this exhibition? LK: In London, with buildings such as the Scalpel, if you’re at street level you can’t even see the top. When I was offered a site visit to the Scalpel, I was looking out where there wasn’t a wall – so I could see 360 degrees - and then draw that, which one cannot see from the ground. And because it’s small there is far greater access, a tremendous chance to see things: street level, up in the air, 360 degrees. The only thing I’ve not done is climb out of a helicopter! LC: Your pieces are also incredibly vibrant, and the use of colour evokes the work of German expressionist painter Franz Marc. What prompted your decision to work in such bright hues? LK: I love the fauvist painting and the French school, and I’ve always liked very bright colours so it is entirely consistent with that. And, I confess, it is also a short cut – those four [primary] colours, and indeed mixtures of them, give you perspective and add a certain amount of drama. LC: Today many artists are using the sites such as Instagram to showcase their work and reach a wider audience. How do you view social media in relation to your own work, and art more broadly? LK: Well pre-digital none of this existed, but I discovered that I love it, and I’m about the oldest person doing it! Even if you don’t draw, you can use all these platforms to join other people, and see all your students work and people you admire – so it very exciting. The only thing is, you can look at Instagram and think, where did that half hour go? However, if you’re a very clever person you don’t let yourself get drawn within, you use it to follow and display. And I’m unashamedly very happy at reaching many more people with the iPad than I could with pencil! LC: Do you have a favourite building in London? LK: I think the Gherkin, because I’m just dotty about the shape and the sort of zig zag diagonals, lattice work - and it’s all glass! I just think it’s so beautiful. But I also love the Scalpel which I think is going to be so dramatic, as well as the Cheese Grater and the Lloyd building which are all around each other. LC: As a native Londoner, can you share your favourite things about the city/any recommendations? LK: I think the winning way to do it is to go along the Embankment, which is rather picturesque. You can start off at Westminster bridge and then go along Tower Bridge and end up in Bermondsey. While Tower Bridge is full of tourists, they’re not wrong – it is one of the views you can be proud of.